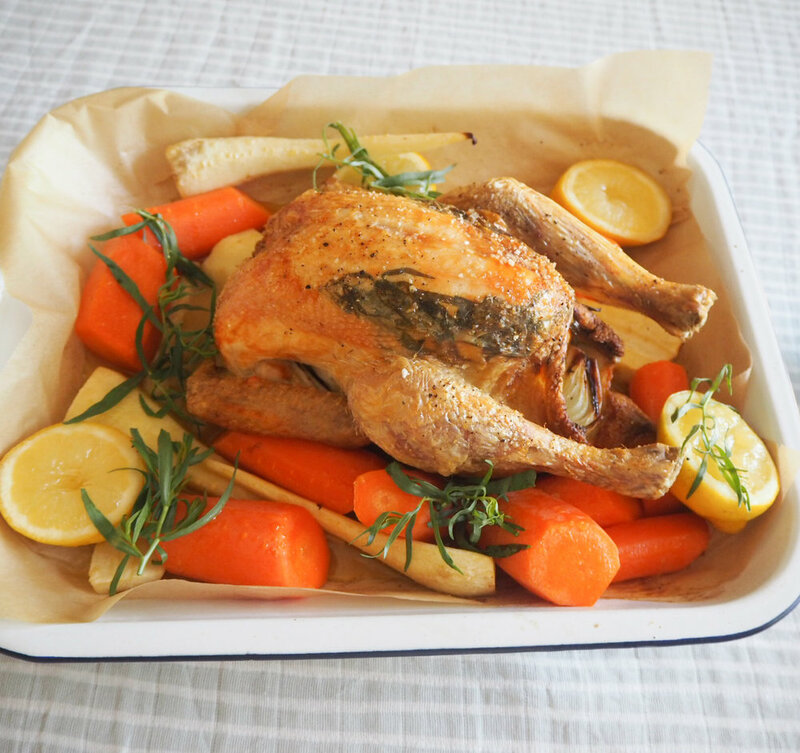 In honour of my husband William, who doesn't feature in Mimi's Bowl very often, I wrote up his favourite roast chicken recipe for father's day. This is a family favourite too and really is a taste of home for us all. If you cook this on a Sunday, you'll have leftover chicken for the next few days and I often make the bones and carcass into a stock too, so nothing is wasted. We don't eat meat all the time, but when we do I buy the best quality meat and use it all up. If you haven't attempted a roast chicken before don't be intimidated, its 5 mins prep and then it just goes straight into the oven to cook. Preheat the oven to 180C (fan oven). To prep the chicken: remove from the fridge, place on a baking tray and bring up to room temperature (30 mins). Meanwhile peel the onion and cut into quarters, place in the chicken’s cavity with 1 lemon halved and 6 garlic cloves. Create two pockets, under the chicken’s skin, and push the fresh tarragon into the pockets (under the skin and above the breasts). Generously rub the skin of the chicken with olive oil and season with black pepper and sea salt (optional). For a small-medium size chicken: place in the oven to cook for an initial 35 mins. Prep the vegetables and place in a bowl with the remaining lemons (halved): toss in olive oil and season with black pepper. Remove the chicken from the oven, add the root vegetable chunks and lemon halves to the bottom of the tray, then place the chicken on top. Return the chicken and vegetables to the oven, for a further 35 mins (this way the vegetables won’t overcook). Cooking time does depend on the size of the chicken. To ensure the chicken is cooked pierce the chicken in its thickest part (thigh) and ensure the juices run clear. If not return the chicken to the oven for extra cooking time. Rest the chicken for 20 minutes, then serve the chicken alongside the vegetables, with the juice of the roasted lemons (optional and not for smaller babies), enjoy.